Please know how much I appreciate the excellent service from HRC. The staff is so kind and caring, they made me feel like family. They really had concern and empathy for me. I would recommend HRC to anyone needing great care and service. I am very satisfied with Dr. Tomlin’s care. The quality of the hearing aids meet my needs very well. I am looking forward to our visitations in the future. Samantha is originally from Paola, KS, and graduated with her Bachelor’s degree in Habilitation of the Deaf and Hard of Hearing from Texas Christian University in Fort Worth, Texas. After graduating, she worked as a deaf educator and parent-infant advisor for several years before returning to school. She recently graduated, earning her Doctorate in Audiology from the University of Oklahoma Health Sciences Center. 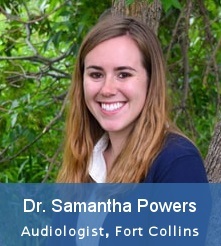 Samantha started her journey at Hearing Rehab Center as an Audiology Resident and now is an Audigologst with HRC. She enjoys getting to know her patients and helping them solution so they can hear their best. Outside of helping people hear better, she enjoys spending time with her husband and two dogs, hiking, traveling, and baking cookies. Sandi Brungardt started working in hearing care in June 1999. She received her Board Certification in Hearing Instrument Sciences in June 2002. Sandi and her husband operated their own hearing business for three years before joining HRC in 2007. After 19 years, it is still a great pleasure to see the smiles and laughter our patients have with better hearing in their life and around their families and friends. The HRC staff is caring and concerned about their patients needs. At home in Frederick, Sandi enjoys spending time with her husband and two sons and families. She loves photography and has been writing an autobiography for her four grandsons. She and her husband are looking forward to retirement in Arizona and traveling the USA in future years.